For a long time, Marvel has dominated the DC comics for a couple of years. From the initial release of Iron movie, marvel has continued to come up with movies that are based on comics like Captain America, the Avengers and Thor. Playtech saw a business opportunity in this and started the Marvel comic slots. Although Amaya is talented when it comes to development of games, it would hardly outdo the resources that are available at Playtech. This is the reason as to why Amaya sought for igaming rights for less known DC comics. This might change with the 2016 launch of Batman Vs Superman movie. If there is a rise in the popularity of this, then it will make Amaya’s Wonder Woman slot known as well which will be well worth their time. 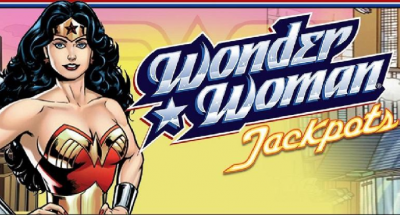 The official name of the slot is Wonder Woman Jackpots. This slot comes with 5 reels and 9 pay-lines. As a player, you will have complete control on the pay-lines. This will allow you to wager on the pay-lines you wish and bet the amount you can afford. On this game, the lowest possible bet you can place would be $0.05. The design of the slot is pretty impressive. Amaya has maintained a great style similar to other DC slots. In the background you have the rough sketch of the city while the colours give you the true picture of the comic book’s past days. The official wonder woman logo is added to the slot and offer’s crucial layer of authenticity. The wild symbol in the game is represented by the Wonder Woman. The wild symbol can take place of any symbol apart from the scatter. When you land 5 Wonder Woman Symbols on one payline, you will trigger a multiplier of 4,000 times. The scatter symbol on the slot is represented by the Wonder Woman logo. When you land three or more of these symbols, you will have 10 free spins activated which is coupled with three times multiplier. When on this free spins play, you can have more free spins retriggered. The progressive jackpot on the slot is designed in a similar way to the multi-level Marvel mystery progressive jackpot. This one has three levels instead of the traditional four. Wonder Woman can trigger the hero Jackpot, Super Hero Jackpot and Mega Hero at random. On the other hand, the slot states that stakes that are large will give rise to a progressive jackpot that’s more.